The FlexiCoat FC System is an inline programmable 3-axis small footprint platform designed for depositing catalyst coatings onto PEM fuel cells, GDLs, electrodes, various electrolyte membranes, and solid oxide fuel cells with suspensions containing carbon black inks, PTFE binder, ceramic slurries, platinum and other precious metals. The FlexiCoat FC is an inline 3-axis programmable coating system designed for applying precision coatings in fuel cell manufacturing processes, including coatings for PEMs, GDLs, electrodes, various electrolyte materials, and solid oxide fuel cells (SOFCs) with suspensions containing catalyst inks, PTFE binder, ceramic slurries, platinum and other precious metal catalysts. 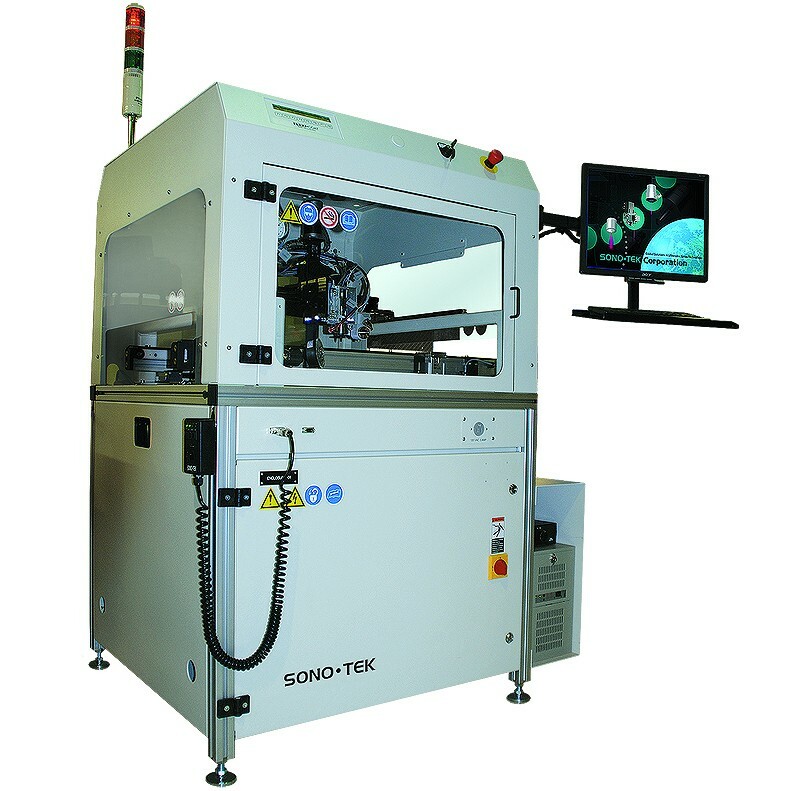 Ultrasonic spraying systems maximize the use of expensive carbon based inks with homogenous deposition of nanosuspensions, requiring less load of platinum to produce much higher cell efficiencies than knife coating or paste processing. Uniform thin film coatings of catalyst inks are deposited onto Nafion fuel cells without deformation of the membrane. The high degree of uniformity achieved with ultrasonic spray ensures the maximum surface area exposure of Platinum in Hydrogen fuel cell construction. Ideal for mid-level production volume, the FlexiCoat FC employs robust ball-screw slides driven by precision stepping motors. Any Sono-Tek nozzle can be integrated. Spray patterns are easily shaped, ranging from 2 - 50 mm (0.08 - 2") wide. Several integrated liquid delivery options are available, depending on the system configuration. *FlexiCoat FC systems incorporate either Accumist, or Impact nozzle air shaping technologies.